Western blot analysis of total (left) and T183/Y185 phosphorylated (right) JNK. HEK293 cells were either untreated, treated with phosphatase or exposed to UV radiation. T183/Y185 phosphorylated JNK levels were analysed using Mouse anti Human JNK (p Thr183/p Tyr 185) (MCA5991GA). 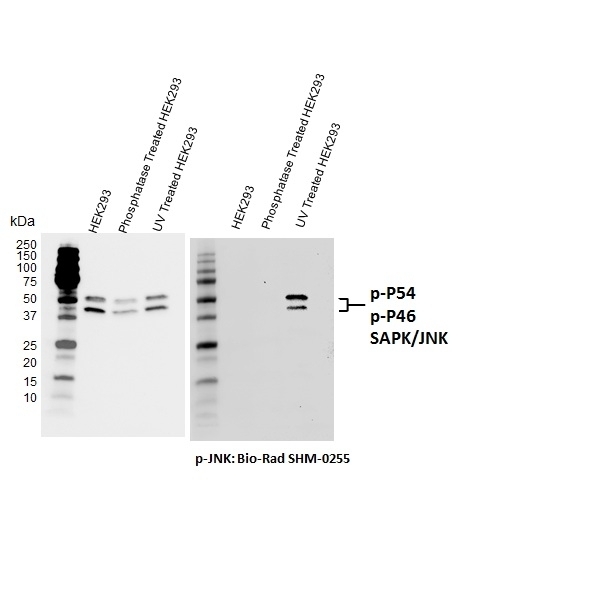 Mouse anti JNK (pThr183/pTyr185) antibody, clone D04-7G6 recognizes the c-Jun N-terminal kinase (JNK), when phosphorylated at threonine 183 and tyrosine 185. Phosphorylation of these residues is associated with the activation of JNK following exposure to enviromental stress (e.g. UV). JNKs are members of the mitogen activated protein kinase (MAPK) family which constitute several signalling pathways. In this signalling cascade extracellular stimuli activate small GTAPases (of the Rho family) which in turn acitvate MAP2K4/MKK4 and MAP2K7/MKK7. These kinases then in turn activate JNK. JNK then interacts with a variety of downstream targets including other signalling molcules and transcription factors (Sehgal & Ram, 2013).